We study the Bornean white-bearded gibbon (Hylobates albibarbis), which is listed as Endangered on the IUCN Red List of Threatened Species. 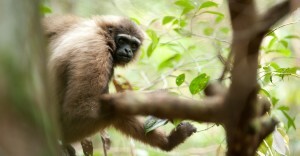 Since the project started in 2005, we have studied seven wild gibbon groups in the Sabangau Forest, where OuTrop is based. We are currently focusing our research efforts on three of these groups. Behavioural data is collected by experienced field staff and contributes to a database that now accumulates over seven years worth of data on individually identified gibbons. We are the only project in the world to have access to a long-term dataset of this type. Gibbons are harder to study than orangutans because they travel very quickly through the forest canopy and are difficult to habituate. We are therefore very proud of our Gibbon Behaviour Project, which is one of very few long-term studies of these primates in the world. Azis K (Gibbon Behaviour Project Coordinator) coordinates a field team who follow wild gibbons from 5am in the morning until they find a sleeping tree in the afternoon. We monitor their population size, distribution, social behaviour, diet, development and health; study how energy intake is governed by food availability; investigate singing behaviour and effects of changing climatic conditions on this; investigate the effects of anthropogenic disturbance and conservation measures on the gibbon population; and compare gibbon behaviour, diet and nutrient intake with that of the sympatric orangutans and red langur monkeys. We have a lot of current plans both within Sabangau and beyond. Singing is an important part of gibbon behaviour and social structure, but this is still not well understood. We want to investigate these songs and what they mean for the family group. Also, crucial for any young primate is the relationship with their mother and gibbons are no different. How young gibbons develop and learn is important to understand. Across Sabangau and the wider forest landscape in Kalimantan we want to continue monitoring the density and population size of gibbons. The fires in 2015 were devastating for wildlife and people in Indonesia, but we do not know what the long-term impacts could be on the gibbons’ behavioural ecology and we need to investigate this. Further afield we want to continue to strengthen our collaborations and relationships with other gibbon projects around the world and work to share knowledge and expertise to support gibbon conservation.